Sign up below and one of our representatives will be in touch to take you through the simple set up process. Already registered your surf school? If you choose Live Bookings people can book immediately.​ If On Request people can message you first for availability and then book. We have listed our properties in Ericeira on surfholidays.com since 2008 ​ and we really enjoy working with them. So far it has been one of our ​ best partners and we simply love working with them. They provide us with​ very good and nice guests! 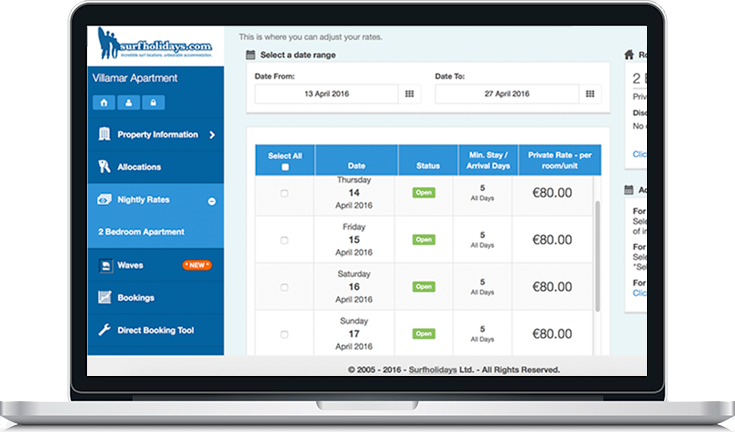 We have been working with surfholidays.com for the past 5 years and they have proved invaluable in providing us with bookings and quality guests. Their booking system is very professional and reliable, making them a pleasure to work with. Nathan Roche, Wave Rider Surf Camp, Fuerteventura. Surfholidays have provided us with a significant amount of bookings from customers all over Europe that we would not normally reach. Clara Brito, Helios Beach Bungalows, Ericeira, Portugal. Surfholidays.com was set up by surfers for surfers. We understand your pain when it comes to trying to receive booking in advance and getting everything organised so you can offer the highest quality accommodation & surf lessons. Add your property/surf school for FREE on our website. We market your place to a large global audience of surfers and people wanting to learn how to surf. night rates, packages, discounts, extras, transfers & more.